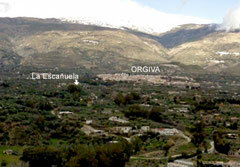 La Escañuela is located in Granada in the Alpujarras. The house sits in "La Ruta de los Olivos Centenarios" (an ancient pathway of centerarians olive trees), surrounded by cultivated farmland. From the cortijo you can enjoy views of Orgiva, Veleta and Mulhacén peaks (the highest in the Iberian peninsula), the Sierra Lújar, Contraviesa and Guadalfeo River Valley. And it's only 20 minuts away from the beaches of Motril or Salobreña. To Córdoba : 210 km. (130.5 miles) (1h 45 min).